At the start of a new Olympic cycle Canada's Amelia Walsh has made the decision to switch from BMX to track sprint as she looks to further her Olympic ambitions with an eye on competing in the velodrome in Tokyo. The data driven 24-year-old was dropped from the Canadian BMX Team in 2014 for not meeting performance standards, undeterred she forged on solo and was selected for the 2015 Pan American Games and the 2016 World Championships. With selection for the Rio Olympic Games missed with injury Walsh had a decision to remain on the BMX to try track cycling. Wanting a new challenge and being able to better utilise data in pursuit of performance Walsh elected to forge on with the track. In just her second major competition on the track Walsh partnered with Olympian Kate O'Brien to claim silver in the team sprint at the Los Angeles World Cup in February 2017. Before going on to finish seventh at the World Championships in Hong Kong. Walsh has spent the last month racing at T-Town in Pennsylvania gaining experience in the sprint and keirin and she looks to continue her progression on the boards towards the 2018 Commonwealth Games and 2020 Tokyo Olympics. You started your career as a BMX rider tell us a bit about yourself who is Amelia Walsh? I started racing BMX in 2007 at the age of 14. I raced my first World Championships as a Junior Elite in Adelaide, Australia in 2009. I was then selected for my first National Team training camp later that year, where I was introduced to Supercross. Supercross is different from a regular BMX track because it has an 8m start hill and the first straight has jumps (gaps) that are 35-40 long, where we go from 0-50kph in 2 seconds. In 2013 I made the move out to Vancouver to join the National Team BMX Program. I had a lot more upsets than victories within the four years leading up to Rio Olympics. In 2014 I was kicked off the National Team because I was not performing to standards on the World Cup stage. I moved to Chula, Vista California on my own, in hope of becoming a better racer. I started working with a new coach, Brendan Arnold, and things slowly started to come around. I was selected to compete for Canada at the 2015 Pan American Games in Toronto, where I unfortunately had another upset. I went back to California for the final push to try to qualify for the Olympic Games the following year. The beginning of 2016 kicked off really well attending two races and coming away with some pretty solid results. Unfortunately, at the first World Cup of the season in Manchester England in April I crashed in practice breaking my arm and knocked myself out. I managed to get back on the bike just in time for World Championships in Columbia just seven weeks after my crash in Manchester. World Championships was my final opportunity to qualify for Rio, which didn't end up happening. When I got home from Worlds I had found out that I had raced with a broken hand and displaced thumb in which needed surgery to fix. After recovering from surgery, I competed at the final two World Cups of the season, making my first semi final at the last World Cup. Aside from sport I am a student at Queen's University studying life sciences. How did the switch to track cycling come about? I was fortunate enough to be training for BMX under the Head Strength and Conditioning coach for track cycling, Brendan Murphy. Brendan and Erin, the National Team coach, always made comments while I was in the gym training for BMX, asking when I was going to switch to track. My response was always "Leave me be till after Rio." So, they had kind of planted the seed, which had been in the back of my mind every since. After finishing up the 2016 BMX season I had to make a choice to either commit to BMX for another four years to attempt to qualify for Tokyo or try track cycling and hope for the best. I sat down with my BMX coach, Brendan Arnold, after the last SX race of the season and I made the decision to try track cycling which he was very supportive of. Erin was a bit shocked when I came back to Milton and said "Alright, I'm in." Do to starting at a late age in BMX, I lacked a lot of race tactics which bit me in the but a lot throughout my BMX career. I loved the adrenaline of BMX, but I had a really hard time with the Supercross side of the sport (8m starting hill) which I hate to admit but that was the reality of it. I worked really hard to make myself comfortable with being uncomfortable. Sadly, my best result at a World Cup SX race was 12th in Sarasota, FL in October, which was also the last SX race of my career. I love chasing numbers in the gym and during sprints. BMX had so many factors outside of these numbers, even if I did have the fastest time to the kink a lot of stuff could happen from there to the finish line. Once I discovered that numbers are everything in Track Cycling, it was a no brainer to where I was headed next. Your first major competitions were the Cali and Los Angeles World Cups in February heading in what were your ambitions? I had no expectations for myself leading into Cali or LA. I had only three months on the bike and was still not fully comfortable with it. I often found myself making little mistakes, like collapsing to one side or slipping my front/back tire off the start. I was thrilled to be selected to compete at the World Cups and I new I would be able to take the same mental approach as I would going into a BMX race. Finished seventh in Cali and then won silver in LA how did you find the racing? What did it mean to win a silver medal on the world stage in just your second major competition? The racing was pretty similar at both events, although the tracks were a lot different. Cali was semi outdoor, so we had the factor of the wind, which wasn't much of a surprise for myself. LA was indoors and a lot like Milton's Velodrome, where we are based out of so it kind of felt like home. There were more teams in LA, so I didn't expect us to do as well as we ended up doing. 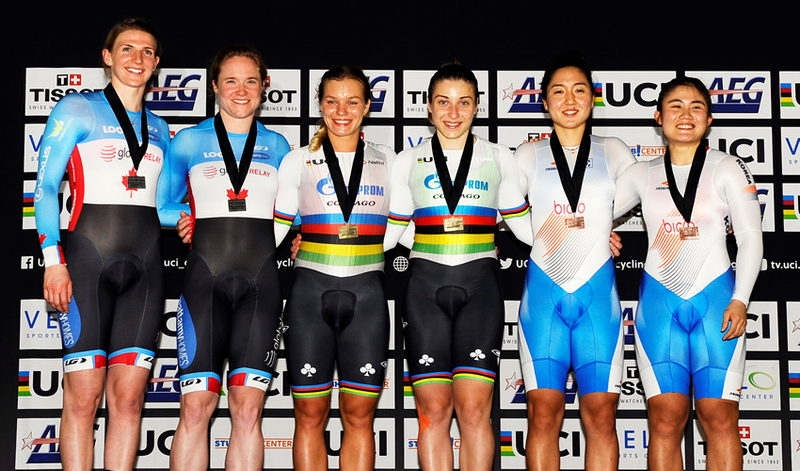 It was pretty surreal for myself standing on the podium with Kate at my second track cycling race. Then followed that up with fifth at the World Championships against some strong competition does the success you have had so far give you confidence going forward? For sure, although I know I have a long way to go and a lot room for improvements. Been racing with Kate O'Brien who has raced at Olympics and Pan American Games how has racing and training with her benefited you? Its been a treat training along side Kate. She is an amazing athlete and an overall great human, with a really interested background coming from bobsleigh. Fortunately, we get along really well and have a general understand of each other, so we make a pretty rad team. I am really excited to see what we can pull of over the next few years, Commonwealth Games being our first big event in 2018. Currently in Pennsylvania racing in T-Town gaining some experience in the sprint and keirin how is it going? It is going well. Riding an outdoor track is definitely a lot different than what I'm used to riding indoors. I raced in the sprint and keirin last weekend which was a great experience. The keirin felt a lot like a BMX race except for the distance. My fitness isn't quite there yet for these races, but we are working on it. Tactically I am slowly figuring out the races but again a lot to learn. Only first started on the track in November 2016 what have been the biggest adjustments and challenges you have found so far? The biggest adjustment for me was getting used to the bike. I wasn't aware of how difficult it would be to sprint out of the saddle on a track bike when I first started, it was very unfamiliar compared to BMX. Once I got the hang of it though I was good to go. "Forced Adaptation" as Erin calls it, was a bit of a challenge but I oddly loved every min of it. My body wasn't used to doing the longer efforts nor was it used to the training loads. Let's just say lactic build up isn't my most favourite thing in the world. A number of riders have gone from BMX to the track like Jamie Staff and Shanaze Reade and achieved Olympic and World Championship success on the track hoping to follow in their footsteps? Why do you think riders are so easily able to transition across? I hope to follow in their foot step one day for sure! I think BMX'er transition over well because we are taught to pedal a bike on really small gears, so the cadence component is already there. Once the strength and tactical component is developed BMX'er are turned into pretty decent sprinters. The gates in both BMX and Track (for team sprint) are fairly similar. I think that is why you seen BMX'er easily transitioning into the starting position for team sprint. Back in 2015 when you were on the Canadian BMX Team you were dropped from the programme but you fought your way back on to her team and while you missed Rio with injury do you think that those two set backs have made you stronger as a rider and motivated you further? BMX in general has changed me for the better. My last chance at Rio was at World Championships where I was racing for a wild card spot. I raced with a fractured hand and missed out fair and square. I don't like to say I missed out on Rio due to injury because I did have the opportunity at Worlds to qualify for the games but failed to do so. I'm able to take everything that I have learned in BMX over to track cycling with me. The biggest one being mental toughness in which I struggled a lot with in BMX but feel like I've hit a milestone with that category in sport throughout my years racing BMX. While new to track cycling you have represented Canada at the BMX World Championships and the Pan American Games is that helping the transition even though it has been in a different discipline? I am able to use the same tools I've developed in BMX with track cycling all the way up until I get in the gate, the only difference is the gate has changed and I have to keep my wheels on the ground. Commonwealth Games less than a year away is that a goal you are working towards? It is one of the main goals for the next quadrant. Right now, my focus is P1 (starter) for team sprint but I hope to be racing the sprint tournament as well. Looking further ahead Tokyo Olympic Games in 2020 your main target? Yes, for sure the games would be my main target, although I don't like to look to far down the road just yet. For now, I am focused on things day by day, session by session.